In July 2018, I traveled from Taiwan to Jordan with a Tzu Chi delegation. Our mission was to conduct some free clinics there; my duty as a photojournalist was to photograph the events. That’s where I met Wang Dan (real name withdrawn on request). Originally from Shandong, China, she married a Jordanian man and so has lived in Jordan for many years. She served as an interpreter at the free clinics. 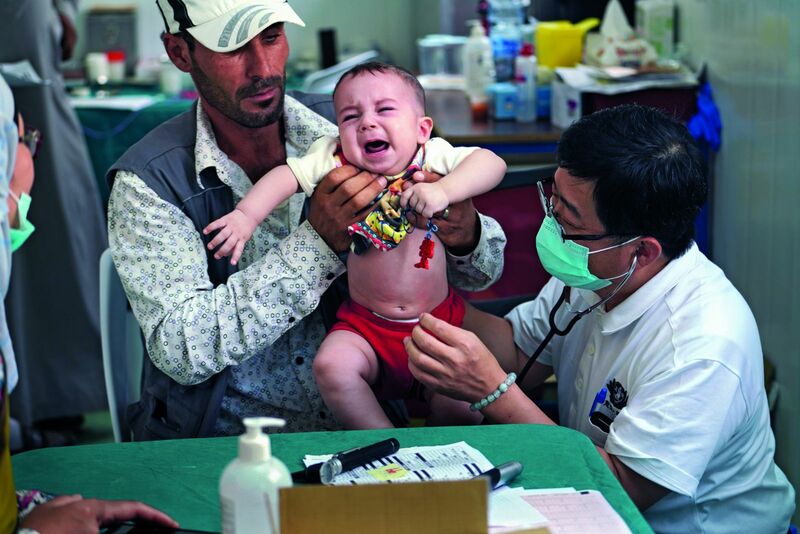 She didn’t know much about Tzu Chi, only that it was an organization based in Taiwan, and that its volunteers had come to Jordan to provide free medical services for local Syrian refugees and needy people. After working together for a couple of days, we came to know each other better. Chatting one day while we had a few free moments, I told her a little bit about Tzu Chi. I mentioned that all the medical professionals and support volunteers that participated in the free clinics had traveled to Jordan on their own time and money, that they had flown over ten hours to this Middle Eastern country and paid every dime for their own transportation and lodging to serve the needy. I also mentioned that, aside from Taiwan, there were also volunteers from the United States and Malaysia. Together they worked with dozens of local volunteers to pull off this humanitarian mission. After hearing what I said, Wang Dan opened her eyes wide in disbelief at what she felt was a most amazing thing. I wasn’t surprised at her response. I would’ve been like her if I hadn’t had the opportunity to work with volunteers from the Tzu Chi Foundation on many occasions previously in my role as a photojournalist. It’s hard to imagine that in this day and age, people are willing to do such “silly things” as Tzu Chi volunteers. They use their own time, money, and energy to do others some good. Why do they do it? What do they get from it? I am not them, so I can’t speak for them. But I feel that when others are in need and you reach out to them, the responses from the people you help make all your efforts worthwhile. This may sound abstract, and unless you’ve had similar experiences before, it may be hard to understand. But when you get right down to it, it all comes down to what makes us human. When others struggle in pain, how can you just stand by and watch? Sharing in others’ suffering and extending a helping hand, that’s what people do. I didn’t tell Wang that day during our chat that not everyone who is willing to pay for their trip can join an international mission like ours. There is a long line of people waiting to give of themselves on occasions like this. This is no secret in the group. Everyone knows it; they just don’t think it is worth talking about. But as I wrote this article, I couldn’t stop my pen from putting in a word about this. I want my readers to know that in this world, there are many endearing humanitarians who, consciously or not, use their own actions to blur the intricate lines between races, religions, political affiliations, and ideologies. Tzu Chi held five free clinics for Syrian refugees and needy people in Jordan in July 2018, benefiting 2,400 people.